"Source of top quality blue chalcedony"
Chalcedony is one of the world’s oldest gemstones, but it’s constantly showing new laces. According to archaeologists, humanoids have worn stones, ivory, bone, and certain organic items for personal adornment for about 75,000 years. 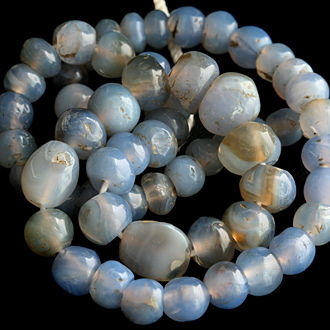 From the beginning, one of the most popular gemstones was chalcedony in various forms, including, flint, agate, chert. and jasper. Any stone that’s still being worn after 75.000 years certainly has something going for it. What is this gem that has captured the human imagination for so many millennia? Mineralogy books generally define chalcedony as all cryptocrystalline varieties of quartz, either transparent or translucent. having the luster of wax. The body color can be white, gray, blue, pale to dark brown, or black. There are also other shades, and many have variety names. The term “chalcedony” covers carnelian, sard, chrysoprase, plasma (bloodstone), agate, onyx, sard, onyx, jasper, flint, hornstone, and agate-jasper. The gemstone industry tends, for marketing reasons, to limit the definition of chalcedony somewhat more than mieralolgists. Among gemstone and jewelry sellers, the term chalcedony is usually used to refer specifically to semitransparent to translucent white, blue, pale grayish-blue, purple, pink, yellow, orange, red, or solid-colored materials other than carnelian, sard, or chrysoprase. Early chalcedony gemstones were mostly pressure-chipped, with some pieces shaped and polished by rubbing. 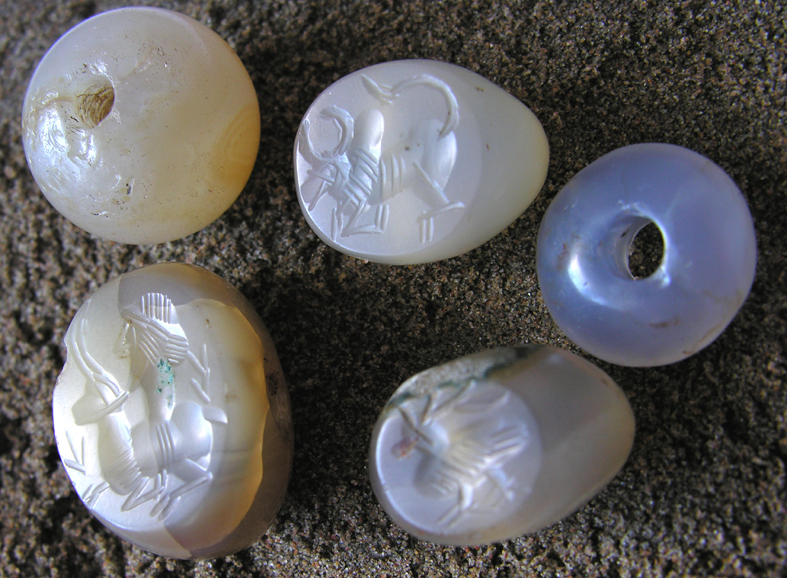 As civilizations rose over the past 4,500 years, chalcedony began to be inluding finely-detailed, high-quality carved agate and carnelian, seals, scarabs, and carved or polished beads. Materials recovered from ancient ruins also document the mining of agate from the Idar-Oberstein region of Germany for almost 3,000 years. The agate mines gave rise to a lapidary idustry that’s at least 500 years old, and today the gem cutters of Idar Oberstein are famous worldwide. In more modem times, the use of chalcedony in jewelry has been eclipsed by more popular stones, like diamond, ruby, emerald, and sapphire. But in the past decade the gem has been making a come back, especially the solid colored, semi-transparent to translucent varieties and the scenic agates and jaspers. Michael Randall of Gem Reflections of California believes that he can trace the most recent increase in his wholesale and retail sales of chalcedony, agate, and jasper to the aftereffect of Tiffany & Co. manufacturing and promoting chalcedony jewelry. Although the translucent chalcedony appeals to a similar market as the one of-a-kind agates and jaspers, with the growing popularity of gems like blue chalcedony, the two materials are growing apart in terms of demand. “The chalcedony market is a separate market from agate, jaspers, petrified wood, and drusy,” observes Jason Penn of Jason Penn Designs in Tucson, Arizona. “Chalcedony is a market term [for] the fine, single-colored, translucent to nearlytransparent material, and it is much more highly prized and priced…. The chalcedony market is a sine curve type of market,” meaning that the highs and the lows in the market are of about equal duration. While chalcedony, especially in its blue to purple color range, has been enjoying a wave of mainstream popularity over the past few years, brightly-pattemed agates and jaspers are holding their own in the more specialized designer world. The markets for these gems do share a number of common elements, however. Penn specializes in one-of-a-kind non-calibrated cabochons. He cuts all types of material, but finds that chalcedony, drusy, and scenic jaspers are his best sellers. 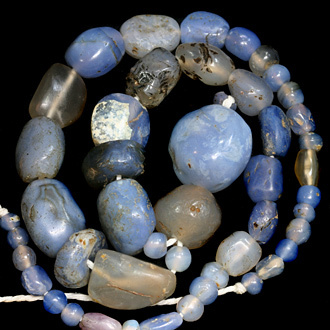 Tom Munson of Desert Mountain Gems, much like Penn, markets to a number of local jewelers and designers, and the majority of his work is with materials from the mineralogical classification of chalcedony. Maxam Magnata of Maxam Magnata in Tucson, Arizona, has also found success with a specialized niche. Even in natural drusy, international competition is driving prices down. The author has observed that the market for unenhanced blue drusy is firm at about $0.90 per carat for custom-cut sizes and shapes. In past years, blue drusy material of this quality might have sold for as much as $3 to $5 per carat. The only segment of the market where prices for drusies, agates, and jaspers is still strong is the high end. A common complaint in the industry is that while the cost of rough and prices for finished cabochons have been steadily increasing, the yield from rough has only increased slightly. Good blue and purple chalcedony is being mined in Turkey and several locations in Africa, including the hard to get Namibian material. Indonesia is producing purple chalcedony along with other colors, including yellow to deep orange. And the United States has active blue and purple chalcedony mines of its own, although the western part of the country is perhaps better known for its beautiful agates and jaspers. Other U.S. miners and most of the foreign ones have been slower in changing to larger-scale mechanized mining. Many are still digging with jackhammers and pry bars, while others drill and blast. These methods often result in more breaking and fracturing and the recovery of smaller pieces of rough. The use of hydraulic excavators for mining does require much higher up-front mining – costs, but long-term production and reclamation costs often are less, and the amount and quality of material recovered is much greater. In the United States, the mining of the various types of chalcedony is transitioning from a hobbyist activity to a more professional effort. There have always been a number of professional miners involved in the recovery of chalcedony, but today their operations are becoming more mechanized, with more attention paid to the quality and size of the rough recovered. Despite the demand in the high end of the market, and the increase in the price of chalcedony over the past few years, its popularity appears to be on a downswing. Just remember, though: Even when chalcedony in all its forms is down, it’s never out.